Announcing the Zone's 2011 Birthday Project for MercyCorps--Unite for Japan! Give in Johnny's honor and help Japan recover from March's earthquake and tsunami. One of the Johnny Depp Zone’s most cherished traditions is our annual birthday gift for Johnny, called the Birthday Project. Each year we choose a charity which is connected to Johnny’s philanthropic interests. We pool our modest contributions and make a Zone donation to a worthy cause in his honor, as a way of celebrating and thanking Johnny for all the joy he has given us over the year. This year, the people of Japan desperately need our help, due to the devastating earthquake and tsunami of March 11, 2011 which left more than 13,000 people dead and another 14,000 people missing. According to the United Nations Office for the Coordination of Humanitarian Affairs (OCHA), 200,000 people are still taking refuge in evacuation centers. About 260,000 people do not have access to water and 180,000 households are without electricity. So the 2011 Johnny Depp Zone Birthday Project will benefit. . .
How incredible it is to remember that just a week before the earthquake, Johnny was in Tokyo for the premiere of The Tourist; many of our Japanese Zoners were among the jubilant crowds who greeted him so warmly. Then tragedy struck—the strongest earthquake to hit Japan in a hundred years. We are heartbroken for our Japanese friends and want to help them recover and rebuild. We can think of no birthday gift more fitting than to answer Johnny’s plea and give what we can to help those in Japan who have lost so much. Unite for Japan is not a charity in itself; it appeals for donations to existing charities. The Zone chose Mercy Corps from among the charity partners listed under Global Giving because Mercy Corps is highly-rated by Charity Navigator; it has a long-time relationship with Peace Winds and people on the ground in Japan; and its programs address basic needs like shelter, water, and medical care. Mercy Corps is a 501(c)3 charity; your gift is tax-deductible as allowed by U.S. law. As in past years, the Zone has set up a Paypal account strictly for 2011 Birthday Project contributions to benefit Mercy Corps’ Fund to Help Survivors of Japan’s Earthquake. This is a particularly easy way for international donors to contribute to the Birthday Project, since Paypal will convert your local currency to dollars. We have also set up a special fundraising page on the Mercy Corps website, if you wish to donate by credit card. Zoners or visitors with a Paypal account who would like to make a donation in any amount can donate to the 2011 Birthday Project here. You may donate by credit card on our fundraising page on the Mercy Corps website. Some Zoners prefer to donate by personal check or money order. 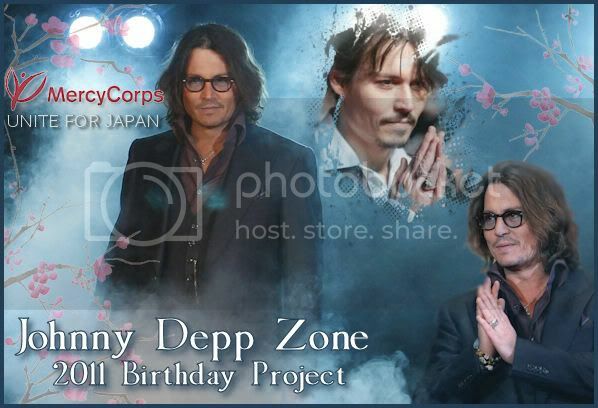 Checks and money orders should be made payable to Mercy Corps’ Help Survivors of Japan’s Earthquake Fund, with this note in the memo section: Johnny Depp Zone Birthday Project. If you donate directly, please email theresa@johnnydepp-zone.com with your screen name and the amount of your donation, so we can add you to our donor list and keep our donation totals accurate. Thanks! We will be accepting donations through Johnny’s birthday, June 9, 2011. Your donation can bring comfort and support when it is needed most. When we pool our small gifts together, we can do a lot of good for others. Please join us in wishing Johnny Depp a very Happy Birthday, and in saying for all the joy he has given us, by donating to the 2011 Birthday Project. Re: Announcing the Zone's 2011 Birthday Project for MercyCorps--Unite for Japan! It will be my pleasure and privilege to honour Johnny's request for help by donating to this worthy cause. Thank you PTP and Theresa for choosing MercyCorps and for making it easy for all to donate by presenting all the various payment options. I hope we are able to make a difference for those so in need. Thank you PtP, what a wonderful project to choose, so apt considering Johnny's recent trip and of course his love for Japan. Being an anime addict and chatting on anime websites I've learnt firsthand just how much the disaster has cost so many and makes me appreciate how precious but fragile life is. I'm sure MercyCorps will be grateful for any and all donations, they work so hard to help so many. I will start donating right away. Great that you chose a cause which Johnny publicly supported. A wonderful way to celebrate Johnny's birthday, in his spirit, and a pleasure to be able to give a little bit in return to everything he gives us. Perfect choice!! I love this time of year...giving something back in the name of someone who has made me laugh, cry and given me so many dear friend. Happy Birthday (almost) Johnny!! We love you!! Thank you ptp, or Arigato as they say in Japan, for choosing Mercy Corps for Japan as this year's cause. A great way to celebrate Johnny's Birthday and an opportunity for us to express our thanks to Johnny for all the joy and happiness that he brings to us and for us to try to pass on even a fraction of the goodwill that he shows towards his family, friends and "bosses"
"If I'm going do to this for a living I want to at least provoke a thought or make someone look at something, however subtle, from another perspective." (JD on acting). Couldn't be a more worthwhile choice for this year's birthday project honoring Johnny Depp. Prior to my current career I worked in the field of international development for over 25 years and it's a small community, you get to know who does good work and who just spends people's money, and MercyCorps is highly respected. Really happy to see Depp Zone chose this route. Thanks for once again setting up a birthday present for Johnny. This charity is a good choice and my donation is on its way. Good idea to donate to Japan. We're in there pitching, doing our part. Johnny made the choice easy this year--that public service announcement for Unite for Japan came at just the right moment. Many thanks to all the Zoners who have already made donations to Mercy Corps--you are fantastic! Once again a brilliant way to celebrate Johnny's birthday - thank you PTP. I have to say that I had been on one site which showed a few charities to make a donation and I was not certain which one was the best but because you have made MercyCorp the charity of choice, and made it so much easier then this is the one I will choose also. Thank you so much PTP - I will be happy to make a donation and may the Japanese people get all the help and support to see them through this tragedy. Quote "" you mean our grandchildren"
In-too-Depp wrote: Thank you PtP, what a wonderful project to choose, so apt considering Johnny's recent trip and of course his love for Japan. Being an anime addict and chatting on anime websites I've learnt firsthand just how much the disaster has cost so many and makes me appreciate how precious but fragile life is. Johnny's public service announcement for Unite for Japan showed us how important this is to him, too. We wanted to answer his call, as much as that's possible. In-too-Depp wrote: I'm sure MercyCorps will be grateful for any and all donations, they work so hard to help so many. I will start donating right away. You're absolutely right--any donation is welcome. When we add all our gifts together, they grow into something wonderful . . . more than we could ever accomplish alone. A wonderful idea Theresa and Ptp in choosing MercyCorps-Unite for Japan. I will be making my donation shortly. Happy Birthday (nearly) Johnny. My dream came true 29/06/09, 25/02/10, 12/05/11, 03/11/11 and 09/05/12. I was looking for some nuts. "We're having too good a time today, we ain't thinking about tomorrow"